Good though slightly lumpy waves on the Surf Coast yesterday morning with fun waves in protected spots to the east, cleaner and more lined up this morning with a touch less size, very good on the Surf Coast reefs. Winds should remain favourable for protected spots until just after midday so make the most of it. Our current swell will continue to ease into tomorrow morning, but into the afternoon we should see some fun new mid-period W/SW swell filling in, holding Friday mixed in with a very long-range and inconsistent long-period signal. Size wise the Surf Coast shouldn't drop below 3ft tomorrow, with the odd bigger set likely into the afternoon, but winds will be average and out of the SW tending S/SW, early out of the W around Torquay. The Mornington Peninsula will likely be around 4-5ft, increasing to 4-6ft later. The swell should hold Friday around mostly 3ft on the Surf Coast and 4-5ft on the Mornington Peninsula, with rare bigger sets at times, but conditions will remain less than ideal with a moderate S/SE breeze, freshening through the day. Keen surfers will still find a few good options across the coast. Saturday looks poor with a fresher onshore S/SE wind and easing swell, better out of the E/NE on Sunday morning but with no real size left across the state. The Surf Coast will be poor and bumpy, deteriorating through the day with a building E/SE windswell and strengthening E/SE winds, while the Mornington Peninsula should offer fun easing 3ft+ sets. Monday should be cleaner with a N/NE offshore but with small to tiny surf on the Mornington Peninsula and a weak easing 1-2ft of E/SE windswell on the Surf Coast. As touched on last update there's nothing too significant on the cards for early next week owing to a blocking high and lack of distant significant storm energy. 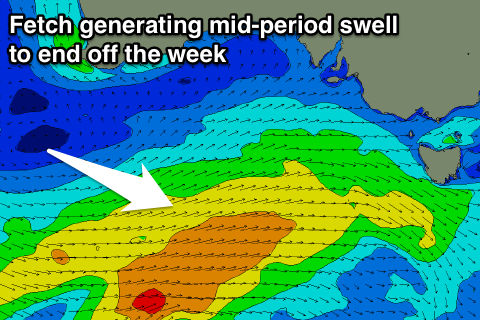 We're looking at another E/SE windswell event later week, so make the most of today's surf.